:What if reconciliation is central to the biblical message? And what if Christians are now awakening to the gospel of peace? 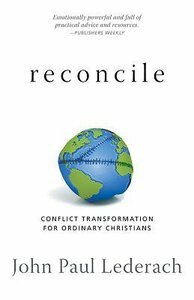 Reconciled: Conflict Transformation for Ordinary Christians by international mediator John Paul Lederach offers guidance for Christians in Scripture and personal applications of reconciliation. Originally published as The Journey Toward Reconciliation and based on Lederach's work in twenty-five countries across five continents, this revised and updated book tells dramatic stories of what works?and what doesn?t?in resolving and transforming conflicts. A section of resources for congregations and small groups offers litanies, discussion questions, resource lists, and practical ideas for peacemaking in everyday life. John Paul Lederach has spent 15 years providing training and supporting peacebuilding in Colombia, Somalia, The Philippines, Nicaragua, and Northern Ireland. Director of Eastern Mennonite University's Conflict Transformation Program, he has conducted numerous research projects and published extensively.